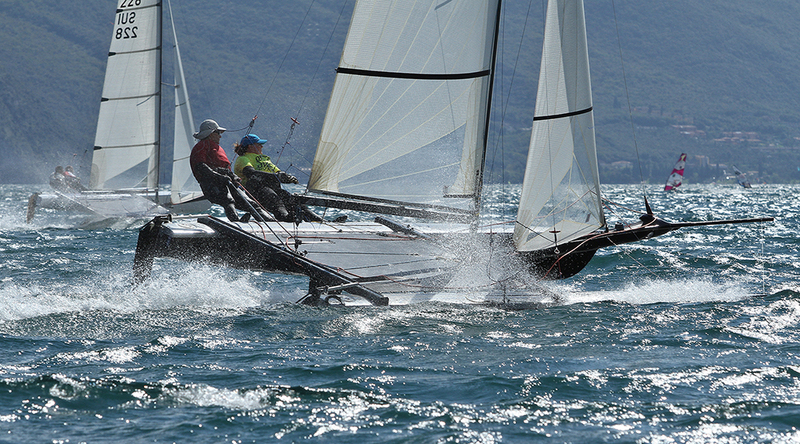 Team Gaebler take the German Open and Torbole trophy victory in fantastic sailing conditions. This year Tornado Class had its 44th Torbole Trophy on the Lake Garda in Italy from the 11th to the 13th of September. It was also the German Open for the Tornados. The President of the sailing club CVT Gianfranco Tonelli and the Tornado Presidents Veit Hemmeter and Jürgen Jentsch welcomed all sailors before the racing. The CVT has its 50th anniversary this year and with the 44th Torbole Trophy the Tornados have a big history in the Sailing Club of Torbole. The Races started on schedule in the afternoon of the first day. Despite the cloudy to rainy weather on this first day the Ora pushed through and three races in strong to light wind conditions were sailed on that day. The weather became better from time to time. So on the second day again three races were sailed in strong to windy conditions. On day three the weather turned to the typical Lake Garda system an the Ora played its full strength. Again the three scheduled races were sailed. The Race committee did a great job on the water and the combination with the Dart Class worked perfect. The same did the chefs in the Kitchen. We had every day a Pasta Party right after the Races and one Dinner with a lot of Italian and local specialities. After nine sailed Races the German Open was won by Roland and Nahid Gäbler on the second place was Martin Rusterholz and Jean Marc Cuanillon and on the third place Bob and Marc Baier. In the Mixed class also Roland and Nahid Gäbler led the fleet. Followed by Dieter Maurer and Katrin Oldenburg on the second place and Jürgen and Sara Jentsch on the third. So we are looking forward to next year for another great sailing at the Torbole Trophy. To introduce more beginners to the Tornado Class the CVT offered a one week training to us. More information will follow soon.